Home > Heavy Duty V Belts > V-Belts. A, B, and C Sections. Standard and Kelvar Construction > A-Section (Classcial) V-belts. 1/2" Wide > A42-KC Ultrapower V Belt. Kevlar Wrap A42 Industrial V-Belt. > 4L440 FHP V-Belt. Industrial Grade. 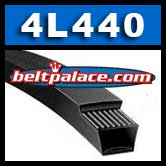 4L440 FHP V-Belt. 1/2” W x 44" Overall Length. Bando Industrial Grade. GATES 4L440, 2440 Truflex V Belts. Delta Table Saw Belt. Delta Part #: 49-034. Sub for Sears belt 400-06-133-0001 and Craftsman 643928 belt. Harbor Freight/Central Machinery 60564* Woodworking Band saw belt, "long belt". *NOTICE: Some 60564 models have reported a manufacturing variance that require a shorter belt (old belt# A900-Li...). Please call for that size. A42-KC Bando Ultrapower V Belt. Kevlar Wrap A42 Industrial V-Belt. 1/2" Wide, 44” Length OC (1118mm). Superior replacement for Standard Raw edge A42, 4L440 FHP V-Belts.